The PSG forward came off injured on Wednesday. 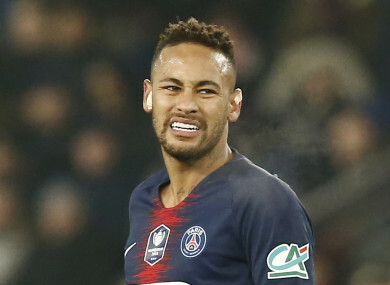 PSG HEAD COACH Thomas Tuchel has told reporters that Neymar has begun treatment for a foot injury he sustained against Strasbourg, but does not know what his return date will be. The world’s most expensive player was in tears as he left the pitch in the 62nd minute of the game following some rough treatment from opponent Moataz Zemzemi. The Parisian’s won the game 2-0 thanks to goals from Edinson Cavani and Angel Di Maria, which ensured PSG qualified for the quarter-final stage of the Coupe de France. However, Neymar’s injury put something of a downer on the celebrations, so much so that Tuchel’s post-match questions revolved almost entirely around the well-being of the 26-year-old. Following the game against Strasbourg, Tuchel had said he was ‘worried’ about the extent of the injury and confirmed Neymar had been taken to hospital. The German coach is especially concerned in this case as it involves the same metatarsal the player injured last year. PSG had already released a statement in which they said: “Initial examinations have revealed a painful recurrence of his injury to the fifth metatarsal of his right foot. Neymar has at times be accused of going to ground too easily, something the Brazilian star has always denied, and so too has his father in a recent Instagram post. The ex-Barca man has also been criticised for showboating and disrespecting the opposition, something Zemzemi appeared to reference when asked by reporters about the incident in which Neymar sustained the injury. A Neymar-less PSG face Rennes on Sunday, before important league games against Lyon and Bordeaux. Email “Neymar faces race to be fit in time for Man United Champions League clash”. Feedback on “Neymar faces race to be fit in time for Man United Champions League clash”.